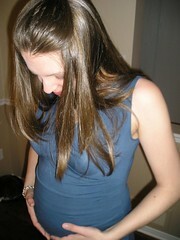 planetrumsey: 21 weeks...It's a girl!?! The weeks seem to keep zipping by. Here is a picture of Shannon in her 21st week. The belly is finally starting to get bigger. We also had our second ultrasound but were unable to get conclusive evidence on whether the baby is a girl or a boy. The ultrasound technician did say they "thought" it was a girl however which is also the consensus amongst most people we know. Hopefully we'll be able to get another ultrasound in a few weeks for more proof. If not we'll just have to wait and be suprised. Posted by Anthony at 3/07/2007 09:27:00 p.m.